This year the kids went evil with the Vampire Princess and Darth Vader costumes. I just couldn't bring myself to buying them off the rack (except for his mask) so we got pretty crafty with the fabrics, thrift store trinkets and lots of spray paint. Cute, edible, and healthier then the other Halloween crap. You're welcome. Here's a way to freak out your neighbors while creating a fun afternoon craft for the kids. Simply cut styrofoam balls in half, paint with glow-in-the-dark paint, then dot the pupils with black. You can stick them anywhere although I found the eyes peering from the bushes the spookiest at night. I couldn't resist this amazingly bold graphic print at Bolt Fabrics this weekend. 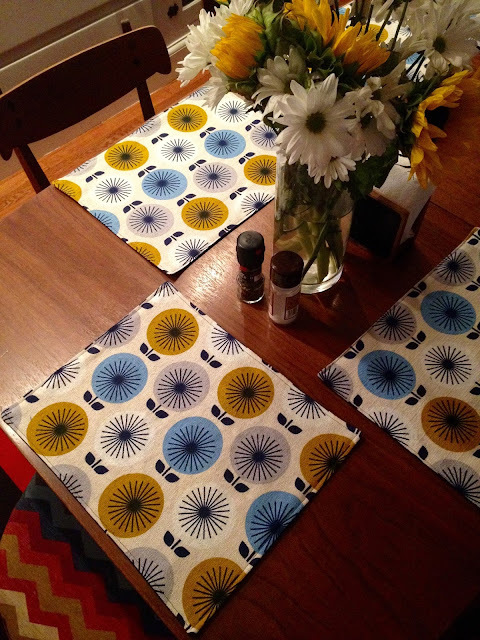 Whipped them into placemats the same day!